that we thought best to run back and go around the island. In passing around we saw four or live wild turkeys on the island. They Hew across to the right and were on the bank. Our company landed with guns, but got no chance of a shot at them. 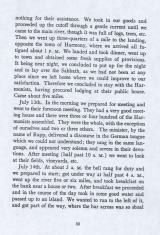 We proceeded on up the river until near 9 o'szlock in the evening and took lodgings on the Hoar at a house on the bank. The current ran very swiftly. It was a hard day's work, though it is said we came but twenty miles, and we . had the wind in our favor about three hours, and then a headwind. The banks of the river were not high and were subject to be overnown in high water, except where we put up. We saw fine pieces of cane on the shore, some of which we took on board before night. July 15th. 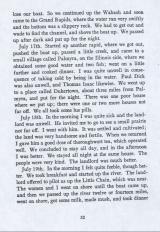 We started in the morning and ran up five or six miles, took breakfast on the beach, then proceeded on up the river ten or twelve miles and took dinner on the bank, then 'went up the river until dark. Not finding a house, we went on shore, made fast, and lodged in the boat. I was very much troubled with the cramp in consequence of swim- ming in the course of the day. 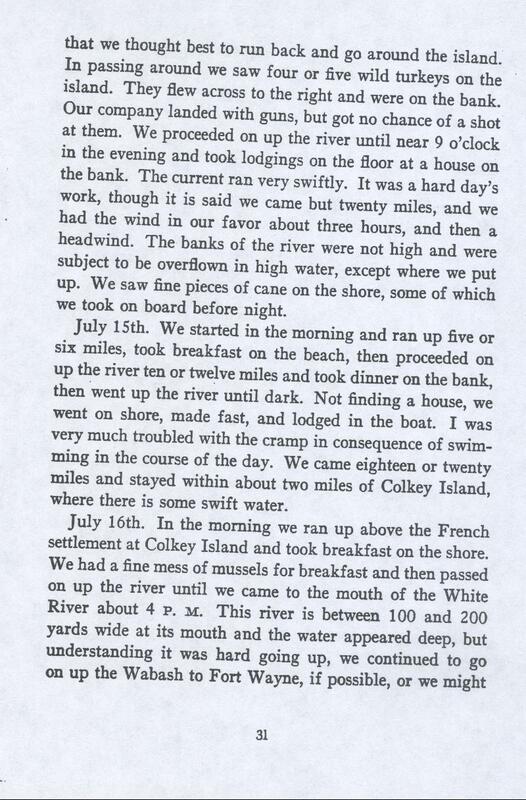 We came eighteen or twenty miles and stayed within about two miles of Colkey Island, where there is some swift water.